These handy bags are fantastic for weekends away, overnight stops, daytrips to the beach or just a fantastic gift bag for life. 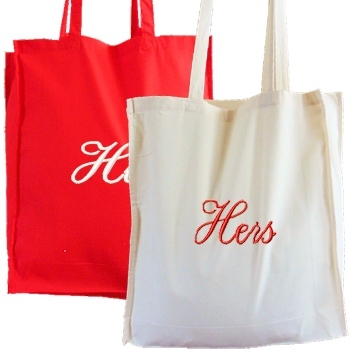 Stylish colours in bright red and natural, these bags can be personalised with His and Hers, Mr and Mrs, first names, nicknames, large initials or any text of your choice. Our sample picture shows alternating thread colours in Script style lettering. Please allow at least 48 hours for us to embroider your customised tote bags.